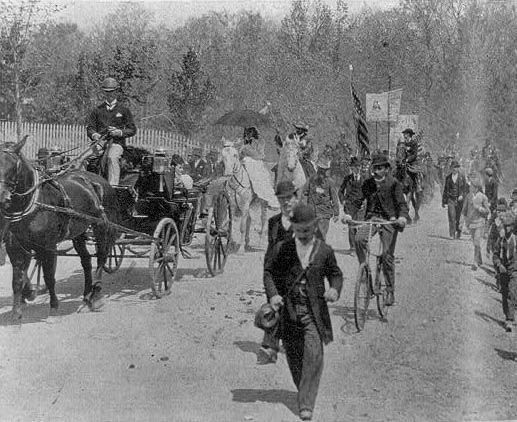 On March 25, 1894, more than 100 men led by businessman Jacob Coxey began a march from Massillon, Ohio, to Washington, D.C., to protest unemployment and urge government to create jobs. "Coxey's Army" was a group of protesters who marched from Ohio to Washington, D.C., to lobby the government for a greater response to the nearly 20% unemployment rate. The "army" is often regarded as the first protest march to the nation's capital. The United States was suffering through the worst economic depression it had ever known. The so-called “Panic of 1893,” caused by the over-financing of railroads (a financial “bubble”) led to an unemployment rate of nearly 20%. Coxey’s Army urged the federal government to create public jobs, such as building roads, for the thousands of destitute, unemployed workers. The ranks of Coxey’s Army swelled as it moved east. As many as 6,000 marchers camped out at a farm site near Washington, D.C., waiting to make their appeal to Congress. Coxey and other protest leaders were arrested for walking on the grass near the Capitol building. Lacking leadership, the marchers dissipated without forcing any action from the government. request for assistance, support, or aid. period of financial speculation in which the price of a commodity is inflated far beyond its real value. Bubbles "burst" when investors become aware of the over-financing and the price drops. official building used by the U.S. Congress in Washington, D.C.
period of economic hardship, when employment and wages are low, and the value of businesses declines. to consider or pay attention to. to endure pain or loss.